Adventure storytelling at its best, Spy, Spy Again is a hilarious nonfiction romp into top-secret enemy territory from the safety of your armchair. 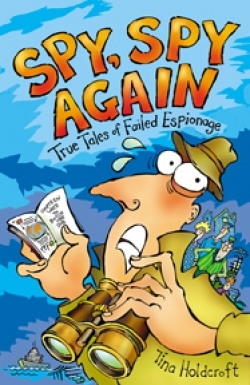 According to this clever graphic novel, countless bungled espionage missions—across the globe and throughout the ages—may be attributed to, among other spastic moves, stressed-out spies botching Morse code; governments placing too much faith in rumors; spies not having time to train properly; and everyone misunderstanding foreign accents. From chapter 1: “Oops, Bad Luck!” to Chapter 5: “On Second Thought…Betrayal,” readers will encounter such big names as Mata Hari and General Napoleon as well as the lesser known “Acoustic Kitty” (a real cat) of Cold War-era fame. Ages nine to twelve.